How Long Can African Cichlids Survive if the Pump Breaks? 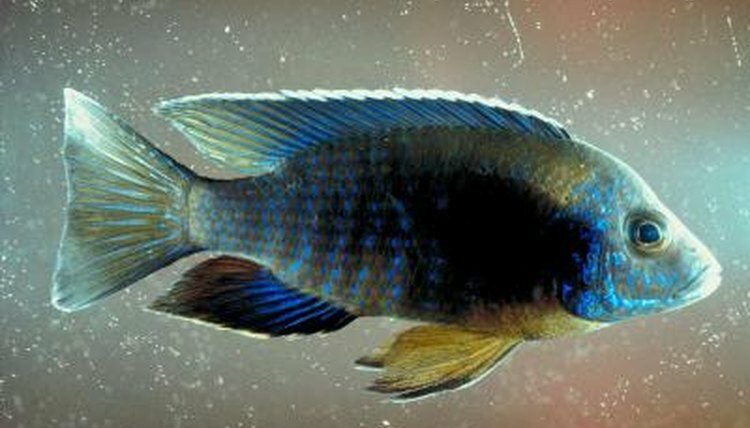 How long African cichlids can survive with a broken pump depends on what you mean by "pump," the type of filtration system you have, whether or not you have live plants in your tank and how many, and the number of fish you have and their overall health. The issue at hand is the amount of dissolved oxygen in the water, which can vary dramatically depending on your tank conditions. "Pump" can mean two different things to the fish tank owner: a filter or an aerator. The filter is a canister attached to the inner wall of the aquarium, a canister outside the aquarium with hoses that feed tank water in and out, a box with rotating wheels that hangs on the side of the aquarium or a flat plastic box that goes under the gravel. It draws aquarium water through layers of filter media to remove dirt and fish waste, then spits it back out. An aerator is a piece of thin tubing attached to a pump that blows bubbles -- it does nothing else. Whether the loss of either will kill your fish depends on your plant situation and the kind of filter you have. African cichlids are gill-breathing fish. They get all their oxygen directly from water. The single easiest way to ensure they have enough, even during mechanical failure, is a heavily planted tank. Aquarium plants make oxygen as a waste product of photosynthesis. They release it directly into the water and fish breathe it, just like in nature where they live without any pumps. Fish in a planted tank don't need an aerator at all -- it's a waste of space and money. They can live with a broken filter until the waste in the water reaches toxic levels, which varies depending on how many fish you have, their size and how often you're cleaning the tank. Filters do two things: remove waste and add oxygen. They add oxygen by disturbing the water's surface. Interior canisters and biowheels add the most; the stronger the flow, the better when it comes to exterior canisters; undergravel filters add very little. A tank without plants needs an uninterrupted flow of oxygen, meaning either a strong filter or an aerator. If you don't have live plants, your fish can live with a broken aerator indefinitely as long as you have a strong filter current. With no plants, a weak filter and a broken aerator, they might survive the day. A broken filter with a working aerator may keep your fish alive for a few days, but you'll need to take care of the problem ASAP because aerators aren't actually very efficient. Fish with no plants, no aerator and a weak or absent current will suffocate within hours. General physical condition influences how long your fish will survive under stressful conditions. None can survive total oxygen loss, but in a situation with some wiggle room, like filter loss in a planted tank, healthy fish will fare better than sick ones, and fish in otherwise ideal conditions will fare better than overcrowded, stressed-out ones. It's best to keep conditions as healthy as possible when times are good to give your fish a better chance when they're not.